comprehensive plan authorized in 1944 for the coordinated development of water resources of the Missouri River and its tributaries, draining an area of c.
..... Click the link for more information. , have created the region's largest lakes, which are major recreation areas. muscular organ that pumps blood to all parts of the body. The rhythmic beating of the heart is a ceaseless activity, lasting from before birth to the end of life. ..... Click the link for more information. , from which it is distributed throughout the body. In addition, the heart employs a separate vascular system to obtain blood for its own nourishment. Two major coronary arteries regulate this blood supply. Blood flows through the heart in one direction only. It is prevented from backing up by a series of valves at various openings: the tricuspid valve between the right atrium and right ventricle; the bicuspid, or mitral, valve between the left atrium and left ventricle; and the semilunar valves in the aorta and the pulmonary artery. Each heartbeat, or cardiac cycle, is divided into two phases. In the first phase, a short period of ventricular contraction known as the systole, the tricuspid and mitral valves snap shut, producing the familiar "lub" sound heard in the physician's stethoscope. In the second phase, a slightly longer period of ventricular relaxation known as the diastole, the pulmonary and aortic valves close up, producing the characteristic "dub" sound. Both sides of the heart contract, empty, relax, and fill simultaneously; therefore, only one systole and one diastole are felt. The normal heart has a rate of 72 beats per minute, but in infants the rate may be as high as 120 beats, and in children about 90 beats, per minute. Each heartbeat is stimulated by an electrical impulse that originates in a small strip of heart tissue known as the sinoatrial (S-A) node, or pacemaker. ..... Click the link for more information. ), but the limited success that has characterized artificial heart implantation thus far has led many experts to question the efficacy of such measures. Although the artificial heart has often been used as a temporary measure until a permanent human donor heart can be located, a number of recipients have not fared well, even for a limited duration. In addition, it is often unclear how long the recipient will have to wait for a donor. Proponents of the artificial heart hope that technological advances will allow the permanent replacement of human hearts with artificial ones. any of several abnormalities of the heart and its function in maintaining blood circulation. Heart disease is the cause of approximately half the deaths in the United States each year. See J. Peto, The Heart (2005). Hearts of invertebrates can be categorized according to the source of the electrical rhythmicity that underlies their beat. Rhythmic electrical activity can arise in the muscle itself (myogenic hearts) or in neurons that drive the heart muscle (neurogenic hearts). Most mollusks and some insects appear to have purely myogenic hearts; these hearts beat normally when isolated from neural inputs. Conversely, the hearts of the higher crustaceans and the xiphosuran Limulus are usually considered to be purely neurogenic: motor neurons impose their rhythmic electrical activity on heart muscle fibers by means of direct excitatory synapses. Without neural input, the heart ceases to beat. Other invertebrates, including gnathobdellid leeches and some insects, have hearts that can produce a myogenic beat but require rhythmic neural input to coordinate that beat and maintain the proper rate. In the marine snail Aplysia, an organism with a myogenic heart, a muscular heart consisting of an auricle and a ventricle is located in a dorsal pericardial cavity. The rhythmic contractions of the auricle fill the ventricle with hemolymph, which is then pumped through the open circulatory system by the rhythmic contractions of the ventricle. The normal heartbeat period lasts about 3 s. A pair of semilunar valves prevents backflow of hemolymph into the auricle during ventricular contraction. Three arteries issue from the ventricle toward the anterior, and a single semilunar valve prevents backflow from them during ventricular expansion. The arteries carry the hemolymph to the various body organs, where they end in tissue spaces. The hemolymph then collects in the hemocoel and returns to the heart by two parallel veins, one through the kidney and one through the gill. Although the Aplysia heart is innervated, its normal beat persists after denervation. The muscular pumping organ of the cardiovascular system. The heart typically lies ventrally, near the anterior end of the trunk; it is ventral and medial to the gills in fish and at the base of the neck or in the chest region of tetrapods. In humans it is located behind the breastbone and ribs between the third and fifth costal cartilages. Its anterior portion or base is directed to the right and dorsally and is the area where the great vessels enter and leave the heart. The lower muscular portion ends in a blunt apex which lies behind the fifth costal cartilage on the left. The muscular wall of the heart, the myocardium, is lined by an inner endocardium and is covered externally by membranous visceral pericardium. There are coronary arteries and veins to and from the heart, which has a specialized neuromuscular conducting system and autonomic nerve supply. In fishes the heart is basically a simple tube which becomes subdivided into four successive chambers, the sinus venosus, atrium, ventricle, and conus arteriosus. Blood from the body enters the sinus and leaves the conus to go to the gills to be oxygenated. The ventricle supplies the main pumping force. When lungs are introduced into the system in lungfish and tetrapods, the mixing of oxygenated and nonoxygenated blood becomes a problem. In brief, the sinus venosus and conus arteriosus disappear, becoming incorporated into the other chambers or the bases of the great vessels. 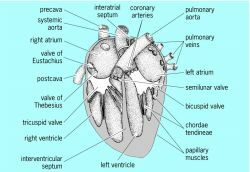 At the same time the atrium and later the ventricle become divided into right and left chambers by a median septum. in the circulatory system of man and animals, the central organ forcing blood into the arteries and maintaining blood circulation. Comparative morphology.IN ANIMALS. Only animals that have a well-developed circulatory system have a heart. Nemertines have a primitive circulatory system, in which the blood is moved along vessels only by the general contractions of the somatic musculature. In annelids blood is circulated by the pulsation of the dorsal blood vessel. Some annelids, for example, earthworms, have additional lateral hearts, which are pulsating annular vessels. Echiuroids, sipunculids, and tentaculites, except brachiopods, do not have a heart. Brachiopods have one heart located near the stomach and connected to the aorta and one to three pairs of additional hearts located on the major arteries. In most mollusks the heart is well developed. Located in the pericardium, it usually consists of two atria and a ventricle. Some gastropods have one atrium, and nautiloids, which are cephalopods, have four atria. A dorsal heart, homologous to the dorsal blood vessel in annelids, is characteristic of arthropods. It consists of a series of heart chambers that are connected to the anterior aorta. Venous blood collects in the pericardial cavity, from which it enters the heart through the ostia, the side openings of the chambers. Echinoderms do not have a true heart. Hemichordates and Pogonofora have a small dorsal heart with a pericardium. Tuni-cates have a tubular heart, which is located in the pericardial cavity; vessels to the pharynx and the internal organs extend from the ends of the heart. Upon contraction, the heart drives blood in alternating directions. Acraniates, for example, lancel-ets, do not have a separate heart, and the contraction of the abdominal aorta and the bases of the so-called branchial hearts circulates blood. The vertebrate heart is a well-developed organ, in the form of a muscular sac with valves and a thick layer of muscle, called myocardium. The heart of fish has two chambers—an atrium and a ventricle. Most amphibians have a heart with two atria and a ventricle, whereas reptiles, birds, and mammals have a heart with two atria and two ventricles. IN MAN. The human heart is asymmetrically located in the thoracic cavity, with one-third to the right of the midline of the body and two-thirds to the left. The base of the heart is directed upward, backward, and to the right, and the apex is directed downward, forward, and to the left. The heart’s posterior surface rests upon the diaphragm. The heart is almost entirely surrounded by the lungs, with the exception of the segment of its anterior surface adjacent to the chest wall. In adults the heart is 12–15 cm in length, 8–11 cm in the transverse, and 5–8 cm in the anteroposterior diameter. It weighs 220–300 g, its proportions to the body being as 1 to 215 in males and 1 to 250 in females. The atria are chambers that receive blood from the veins. The inferior and superior venae cavae, which carry venous blood from the systemic circulation, empty into the right atrium, as do the veins of the heart itself, including the coronary sinus. The four pulmonary veins, which conduct oxygenated arterial blood from the lungs, empty into the left atrium. Both atria are connected to their corresponding ventricles by atrioventricular openings, which, upon ventricular contraction, are closed by cuspidate valves. Papillary muscles are trabeculae and conical protuberances that are found on internal ventricular surfaces. Tendinous cords, which prevent the prolapse of the cusps of cardiac valves toward the atria, connect the tips of the papillary muscles with the atrioventricular valves. The pulmonary and aortic valves, which are located at the bases of the pulmonary trunk and the aorta, respectively, consist of three semilunar cusps that open toward the appropriate blood vessels. Consequently, as the heart contracts, blood from the right ventricle enters the pulmonary trunk and blood from the left ventricle enters the aorta. The heart wall consists of an inner membrane, or endocardium, a middle layer, or myocardium, and an outer layer, or epi-cardium. The endocardium lines the chambers of the heart and is composed of connective tissue containing collagenous, elastic, and smooth muscle fibers, blood vessels, and nerves. The surface of the endocardium is covered by endothelium. The heart valves are endocardial formations. The myocardium, which is the thickest layer, is divided into two or three strata. It reaches 2–3 mm in thickness in the atria, 5–8 mm in the right ventricle, and 10–15 mm in the left ventricle; the differences in thickness are related to the different functional loads. The myocardium consists of myocytes, which are strained muscle cells. Myocytes vary in length from 50 to 120 micrometers and in width from 15 to 20 micrometers. One or two nuclei are located in the center of a myocyte. Myofibrils are the contractile elements that are embedded in the peripheral sarco-plasm. The heart’s capacity to function continuously is related to the presence of mitochondria in the myocytes. Mitochondria contain enzymes that participate in oxidation and reduction processes providing energy to the cell. Intercalated disks are found between adjacent myocytes and combine the myocytes into muscle fibers. Excitation is conducted from one cell to another through the intercalated disks. The muscle fibers of the atria and ventricles originate at the heart’s fibrous rings, which surround the atrioventricular openings. Atrial musculature is separated from ventricular musculature and consists of two layers—a superficial annular layer and a deep longitudinal layer. The fibers of the deep layer loop around the venae cavae at those points where the venae cavae empty into the atria. Ventricular musculature consists of three layers—an external longitudinal layer, an internal longitudinal layer, and a middle transverse annular layer. The interventricular septum consists primarily of muscular tissue lined with layers of endocardium. Its uppermost part, however, consists of only two endocardial layers, separated by a layer of fibrous tissue. The heart contains structures consisting of atypical muscular tissue, the cells of which are poor in myofibrils and rich in sar-coplasm. The atypical muscular tissue forms the conduction system of the heart, which includes (1) the sinoatrial node, located in the wall of the right atrium, between the superior vena cava and the right auricula, (2) the atrioventricular node, located in the interatrial septum, above the right atrioventricular valve, and (3) the atrioventricular bundle of His, which extends from the atrioventricular node to the interventricular septum. The bundle of His divides into right and left branches, which spread out in the ventricular myocardium in the form of Purk-inje fibers. The cells of the conduction system generate rhythmic excitation impulses and transfer these impulses first to the atrial and then to the ventricular myocardia, generating the contraction of the atria and ventricles. The epicardium is continuous with the myocardium and consists of connective tissue. The epicardial surface is covered with mesothelium. At the base of the heart the epicardium turns upward and becomes the pericardial sac, or pericardium. The slitlike cavity between the epicardium and pericardium contains a small amount of serous fluid, which reduces the friction of the heart wall during heart action. Blood is supplied to the heart by way of the right and left coronary arteries, which originate from the ascending aorta. The large veins of the heart collect in the coronary sinus, which empties into the right atrium; smaller veins also empty into the right atrium. The heart has a thick capillary network, and each muscle fiber is accompanied by capillaries. Lymph from the heart flows into the mediastrinal and left tracheobronchial lymph nodes. The heart is innervated by the vagus and sympathetic nerves. Intracardiac ganglia contain efferent nerve cells, which transmit impulses from vagus nerve fibers to the myocardium and coronary vessels. The outgrowths of sensory (afferent) nerve cells, which are also present in cardiac ganglia, form sensory detectors (receptors) in the myocardium and coronary vessels. Sensory nerve cells are in contact with intracardiac efferent neurons, forming intracardiac reflex mechanisms. Physiology. The function of the heart is rhythmically to force blood from the veins into the arteries, that is, to create a pressure gradient that produces a continuous movement of blood. The movement of blood is produced by the alternating contraction, or systole, and relaxation, or diastole, of the myocardium. The fibers of cardiac muscle contract as a result of electrical impulses (excitation processes) that are formed in the cell membranes. These impulses develop rhythmically in the heart itself. The cardiac muscle’s ability to independently generate periodic excitation impulses is called automatism. Even when the heart is isolated from the body, automatism will provide for its contraction if blood or a nutritive liquid is artificially circulated in cardiac vessels. In vertebrates and mollusks, automatism is not characteristic of the entire musculature but only of the atypical musculature forming the conduction system of the heart. The capacity of myocardial atypical cells to generate impulses is related to the gradual reduction of the membrane potential in the cell membrane during diastole (see Figure 1). Excitation is propagated when the resting potential is decreased by 20–30 millivolts (mV). The myocardial cell membrane loses its original charge, becoming depolarized, and a local negative charge is generated on the membrane surface (potential reversion). The rapid change in potential is represented by an electrical impulse (action potential), whose amplitude reaches 90–100 mV. Such a large shift in potential is capable of depolarizing adjacent segments of the cell membrane by 20–30 mV, and consequently, the adjacent segments generate their own impulse. This impulse, in turn, depolarizes the next segment of the membrane. Thus, the action potential, which arises in one segment of the membrane, is capable of spreading along the membrane surface and continuing on to neighboring cells (propagated excitation). In mammals excitation develops at the opening of the venae cavae in the sinoatrial node, which is also known as the pacemaker of the heart because it is here that cardiac rhythm originates. Excitation subsequently propagates through the atria and reaches the atrioventricular node, the cells of which are capable of delaying the conduction of excitation. After the atrial contraction cycle has been completed, excitation passes to the bundle of His, the Purkinje fibers, and the contractile ventricular myocardium. This coordinates the contractions of the atria and ventricles so that the atria always contract before the ventricles, thus forcing blood from the atria to the ventricles. The capacity automatically to generate propagated impulses is characteristic not only of the sinoatrial node, but of other elements of the conduction system as well. However, the rate of the spontaneous depolarization of a cell membrane in the atrioventricular node is 25 to 50 percent less than in the sinoatrial node, and as a result, the frequency of the generated potential is also 25 to 50 percent less. The rate of the spontaneous depolarization of a cell membrane in the bundle of His is 66 to 75 percent less than in the sinoatrial node. A decrease in the degree of automatism in the conduction system (the automatism gradient) is responsible for the reliable generation of excitation in the heart. For example, when the sinoatrial node becomes dysfunctional, the atrioventricular node becomes the pacemaker. Under normal conditions, the automatism of other cardiac segments is repressed by the sinoatrial node, which discharges more frequent impulses and is the major pacemaker. Injury to the atrioventricular node, the most vulnerable area of the conduction system, may result in a heart block, during which the atria contract more rapidly than the ventricles. When incomplete heart block occurs, the atrioventricular node is only capable of conducting each second or third impulse from the atria, and as a result, the ventricles contract two or three times faster than the atria. With complete heart block, the cells of the bundle of His and the Purkinje fibers generate impulses to the ventricles, and the ventricles contract at a slow rate, independently of the atria. Cardiac action potential lasts 0.3–0.27 sec, during which time the myocardium is unable to respond to new stimulations. 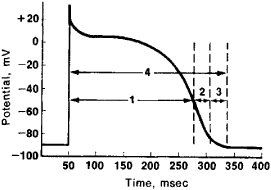 This state of inexcitability is called the absolute refractory period and lasts 0.27–0.25 sec (see Figure 2). Excitability is gradually reestablished during the relative refractory period, which lasts 0.03 sec. A phase of increased excitability follows, during which cardiac muscle is especially sensitive to stimulation. The long phase of myocardial inexcitability is biologically significant because the heart is insensitive to various types of random and extraneous stimuli at this time. No matter how frequently stimuli act on it, the heart is capable of responding only to relatively infrequent rhythmic excitations, which results in the rhythmic contraction of the heart and expulsion of blood. The excitation of a myocardial cell membrane causes the contraction of the cell’s myofibrils. The relationship between excitation and contraction is maintained through an intracellular structure called the sarcoplasmic reticulum, which supplies the region of the cell’s contractile elements with a sufficient number of calcium ions. The membranes of the sarcoplasmic reticulum have special systems capable of actively transporting Ca2+ ions to the myofibrils, resulting in myofibrillar contraction, and away from the myofibrils, resulting in myocardial dilatation. The dilatation process, which is called diastole, is an active process. The rate and extent of diastole are determined by many factors, including the rhythm of cardiac contractility, the flow of blood toward the heart, and the blood pressure in the aorta and the chambers of the heart. The extent and rate of diastole may be regulated by the nervous system. As a result, rhythmic myocardial contractions are responsible for the periodic ejection of blood into the vascular system. The period during which the heart contracts and expands is called the cardiac cycle. The cycle consists of atrial systole, which lasts 0.1 sec, ventricular systole, which lasts 0.33–0.35 sec, and a general pause, which lasts 0.4 sec. During atrial systole, the pressure increases from 1–2 mm Hg to 6–9 mm Hg in the right atrium and 8–9 mm Hg in the left atrium; this causes the blood to pass through the atrioventricular openings into the ventricles. Only 30 percent of the blood enters the ventricles during atrial systole, whereas 70 percent enters on its own during the general pause. Ventricular systole is divided into several phases (see Figure 3). An increase in pressure in the ventricles leads to the closing of the atrioventricular valves, while at the same time the semilunar valves remain unopened. The isometric contraction phase that follows is characterized by the contraction of all fibers and a sharp increase in their tension, while the entire volume of the heart does not change significantly. The pressure in the ventricles consequently becomes greater than the pressure in the aorta and pulmonary artery, which results in the opening of the semilunar valves. The next phase is the blood expulsion phase. In man, blood is expelled when pressure in the left ventricle reaches 65–75 mm Hg and pressure in the right ventricle reaches 5–12 mm Hg. 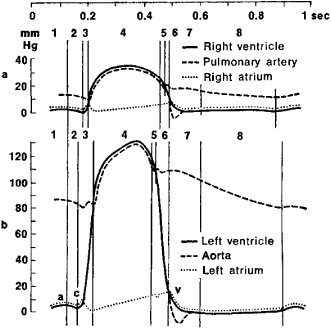 The pressure increases sharply in 0.10–0.12 sec to 110–130 mm Hg in the left ventricle and 25–35 mm Hg in the right ventricle (rapid expulsion phase). Ventricular systole concludes with the slow expulsion phase, which lasts 0.10–0.15 sec. Ventricular diastole follows ventricular systole. Pressure in the ventricles drops rapidly, resulting in a higher pressure in the large vessels and the closure of the semilunar valves. As soon as ventricular pressure drops to 0, the cuspidate valves open and the ventricular filling phase begins. The ventricular filling phase is subdivided into the rapid filling phase, which lasts 0.08 sec, and the slow filling phase, which lasts 0.07 sec. Ventricular diastole ends with the atrial systolic filling phase. The duration of each phase of the cardiac cycle varies, depending on the frequency of cardiac rhythm. Cardiac dysfunction may adversely affect the duration of the phases. The study of the phases of the cardiac cycle is important in evaluating the functional state of cardiac muscle. Cardiac phases may be studied by simultaneously performing an electrocardiogram and phonocardiogram and measuring the pulse of one of the large arteries near the heart. The volume of blood expelled by the heart in 1 min is identical for the right and left ventricles and is called the cardiac output. When a person is at rest, the average cardiac output is 4.5–5 liters (l). The volume of blood ejected by the heart during one contraction averages 65–70 milliliters (ml) and is called the systolic volume. Another indicator of heart action is the work performed by the heart in supplying the blood with potential energy (pressure) and kinetic energy (velocity). Total cardiac work may be calculated as the sum of these two types of energy, using the equation W = VP + MU2/2g, where W is the work, V is the cardiac output, P is the mean pressure, M is the mass of the blood, U is the velocity of blood ejection into the aorta, and g is the acceleration of gravity. The work performed by the heart varies, depending on cardiac output and arterial pressure. The force and frequency of contractions may vary according to the body’s need for oxygen and nutrients. Cardiac activity is regulated by neurohormonal regulatory mechanisms. Signals from the central nervous system reach the heart by way of the vagus and sympathetic nerves. Vagal stimulation usually reduces the force and slows the rhythm of cardiac contractions and reduces myocardial excitability and conduction; sympathetic nerves always stimulate these functions. The central nervous system continuously receives signals about changes in the environment and the state of the body and the activity of organs and tissues. It then transmits the required information to the heart. Some biologically active substances that reach the heart with the blood flow may also serve to regulate its activity; and, as a result, the heart can be made to continue functioning even when it is no longer linked to the central nervous system. For example, biologically active substances regulate the heart’s activity when extracardial nerves are severed or during heart transplantation. The heart also has self-regulatory mechanisms. Some of these mechanisms are related to the specific properties of the myocardial fibers, for example, the interdependence between cardiac rhythm and the force of contraction of cardiac fibers and the interdependence between the contractile energy of the fibers and the extent of the dilatation of the heart during diastole (law of the heart). The heart contracts with increasing force as more blood flows toward it during diastole. Thus, the cardiovascular system is capable of pumping blood from the veins to the arteries even when only the heart is kept alive or when the heart’s connections with the central nervous system are severed. In the 1970’s the heart was first described as being regulated by intracardiac peripheral reflexes. Nerve receptors control the degree to which the chambers of the heart and the coronary vessels fill with blood. They are also capable of changing the force and rhythm of cardiac contractions, thereby automatically maintaining the blood supply to the arteries. Signals that reach the heart from the central nervous system along vagal fibers interact with the peripheral reflexes of the intracardiac nervous system. Thus, the heart is controlled by the interaction of the intracardiac and extracardial nervous regulatory mechanisms. Kositskii, G. I., and I. A. Chervova. Serdtse kak samoreguliruiushchaiasia sistema. Moscow, 1968. Samoilova, S. V. Anatomiia krovenosnykh sosudov serdtsa. (Atlas.) Leningrad, 1970. Kositskii, G. I. Afferentnyesistemy serdtsa. Moscow, 1975. Meerson, F. Z. Adaptatsiia serdtsa k bol’shoi nagruzke i serdechnaia nedostatochnost’. Moscow, 1975. Udel’nov, M. G. Fiziologiia serdtsa. Moscow, 1975. Pathology. Various types of injuries to the heart may lead to cardiac dysfunction, which results in a weakening of myocardial contractility or disorders of cardiac rhythmicity. A pronounced weakening of cardiac contractility may be manifested by heart failure, during which the heart becomes overloaded. Heart failure may be acute, subacute, or chronic. With acute heart failure, which develops in a few hours, or subacute heart failure, which develops in several days, most of the energy generated in the heart is used only to support contractility. There is insufficient energy for protein synthesis, and a wasting of myocardial elements develops. With chronic heart failure there are short periods, lasting from several seconds to 1–3 min, when the inflow of blood to the heart is disproportionate with cardiac ejection; these short periods alternate with long periods of compensation. Cardiac compensation is related to cardiac hypertrophy, which is the enlargement of the entire heart weight resulting from the enlargement of each cardiac fiber. Cardiac hypertrophy develops during the phase of increased energy production in the myocardium; this phase alternates with the energy deficiency phase. Energy for the activation of protein synthesis increases during cardiac hypertrophy. The increase in the mass of myofibrils decreases the load per weight unit of the heart. However, during cardiac hypertrophy a series of pathological reactions occur that consolidate on a morphological level, creating conditions for the development of serious disorders of cardiac rhythm. The increase in the number of mitochondria lags behind the growth of the myofibrils, and the energy deficiency develops in separate heart segments. The muscle tissue of these segments is replaced by connective tissue, which leads to the deterioration of the hypertrophic heart and the further weakening of myocardial contractility. The progressive wasting of the myocardium concludes with fibrillation and cardiac arrest. Disorders of cardiac rhythmicity result from dysfunctions of the major properties of the myocardium, including automatism, excitability, conduction, and contractility. These dysfunctions may be related both to extracardial nervous and humoral influences and to primary damage to myocardial elements. Excitation is abnormally propagated through the heart and arrhythmias are generated by nonuniform breakdowns in the energy supplied to individual myocardial fibers and fiber groups, by changes in the duration of the effective refractory period for separate groups of myocardial fibers, and by disorders of electrophysiological myocardial properties in the relative refractory period (see; ). Meerson, F. Z. Giperfunktsiia, gipertrofiia, nedostatochnost’ serdtsa, 2nd ed. Moscow, 1968. Sarkisov, D. S., and B. V. Vtiurin. Elektronno-mikroskopicheskii analiz povysheniia vynoslivosti serdtsa. Moscow, 1969. What does it mean when you dream about a heart? The heart is the eternal symbol of love, romance, and the very life force within all of humankind. Getting to the “heart of the matter” suggests that the heart rules the source of truth and love. When one is unfair in a particularly insensitive manner, the person and the act are described as “heartless.” Friendship, courage, romantic bonds, and emotional expression are also embodied in this symbol. The hollow muscular pumping organ of the cardiovascular system in vertebrates. The center portion of a log, usually referring to heartwood or duramen.